Mourners in a Peterborough village have been left heartbroken after vandals destroyed dozens of gravestones on a two night rampage. Families were left in tears when they saw the damage at Thorney Cemetery, which was caused on Tuesday night and last night (Wednesday). A number of gravestones had been kicked over and ornaments scattered. The gravestone of Star Thorndike, Tracy Thorndike’s baby, was one of the monuments which was destroyed. She said: “I was shocked to see what had happened. It is difficult to get your head round why someone would do this. “There are a lot of people in tears here this morning. “I come here a lot, and it was upsetting. “It looks like it was a concerted effort - they spent a long time doing it. Matthew Smith was left distraught when the grave of his nine year-old sister was damaged in the spree. Mr Smith said: “Yesterday (Wednesday) was the first incident when about 26 graves were kicked over. The police were called and things were tidied up. “People thought it was down to a Halloween prank - but it happened again last night when more than 30 graves were kicked over. “Its a small village and everyone knows everyone. Cllr John Bartlett, chairman of Thorney Parish Council, which runs the graveyard, said: “It is mindless vandalism. We have never had anything like this since I have been here. “I was up there this morning and a lot of people are very angry and upset. “The stonemason has been to have a look today. Cllr Steve Allen, Peterborough city councillor for Eye, Thorney and Newborough, said: “It is dreadful. It is deeply disrespectful, and has come out of the blue. 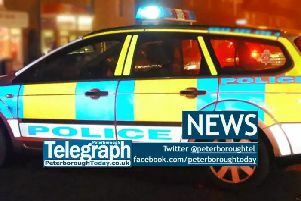 A spokesman for Cambridgeshire police said their crime scene investigation team had been to the scene yesterday, and would be returning today. The spokesman said extra patrols would be carried out in the area following the vandalism. Anyone with information about the incidents should contact Cambridgeshire police on 101, or Crimestoppers, anonymously, on 0800 555 111.